Magnificent! 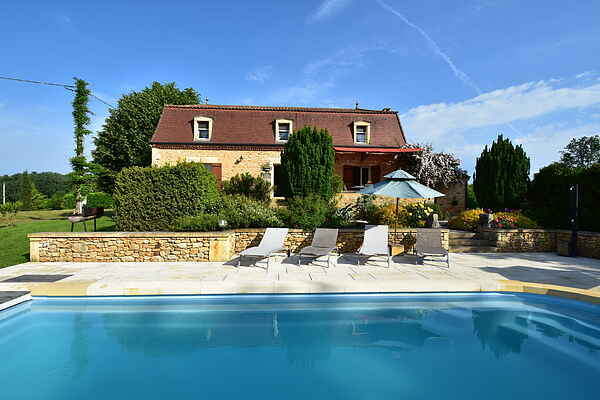 This holiday home in Coux-et-Bigaroque (5 km) is located in a quiet and lush area, complete with gorgeous view of the area. Here you will wake up in the morning in peace and quiet and enjoy the south facing covered terrace; have a little home-made breakfast of hot croissants and a cup of espresso. Afterwards you can descend the Roman steps and have a refreshing dip in the pool. Now you are ready for some fun trips. The choices are endless. An active day canoeing on de Dordogne (canoe rental in Siorac, 8 km) is a possibility, although a lovely stroll through medieval Belvès (14 km) is also a good idea. A visit to the famous caves in the area of Eyzies-de-Tayac Sireuil (14 km) makes a fun day for the children. This lovely area can also be explored on a bike, a bike rental shop is located in Coux. Further from the house the excursions on offer are huge. A lovely day of shopping in Bergerac (45 km), a visit to gorgeous castles like Milandes (24 km), or a visit to beautiful hamlets such as Domme (34 km) and La Roque-Gageac (29 km).